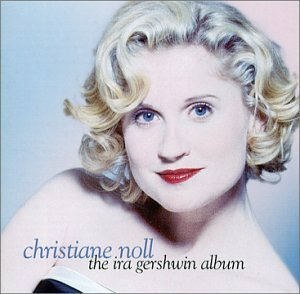 Tony Nominee Christiane Noll graces The Metropolitan Room with the songs of Ira Gershwin. With her shimmering blonde hair and sleek, black dress, Christiane Noll began with an up tempo classic. Noll engages the audience while sharing Gershwin’s great list of collaborators – Kurt Weill, Harold Arlen and, of course, his brother, George Gershwin. With beginnings at Tin Pan Alley, Gershwin’s career has range and depth. Noll, who appeared in Broadway’s Ragtime, adds details about the man who was originally born Israel Gershowitz. We all think we know the songs of Composer Ira Gershwin, but Noll, who also appeared in Broadway’s It Ain’t Nothin’ But the Blues brings a conversational understanding of the era, and polish to the jazz and blues of the times. Sometimes, we all love the songs we already know. Noll breezed through “Fascinatin’ Rhythm,” accompanied only by her piano player David Budway, keeping the sound crisp. She loves the words and, sliding up and down the scale, she handles the music with panache. With “S’Wonderful,” she holds on to the consonance. It’s elegant and impressive, and the “S’marvelous” journey has an elegant, chic feel. There are no flaws from the design team, who light Noll perfectly with cool tones, until the audience sees a glamorous chanteuse, with a glimmer in her eye, and a deep appreciation for the composer. Drawing upon the rhythmic, and sometimes, somber tones of Gershwin, Noll has a perfect sense of the music. Her four octave range and light dance moves absolutely complement and support the music. Her journey as an artist isn’t lost, as she connects with an emotional awareness that is entirely credible. The songs, originally released from a Noll’s CD in 2001, are surprisingly refreshing. “Tchaikowsky” is one of those tuneful melodies that keeps everyone on their toes. Intelligence is part of the fun for Noll, who breezes through this song about Russian composers. She also shows a cutesy appreciation of Americana. With practiced nasality and a brilliant use of the microphone, she never leans toward syncopation, but rather, stays right on the one, finding nuance in each phrase. Similarly, with “By Strauss,” her fantastic range, and playful, witty interpretation of the songs, keeps the audience with her every step of the way. She gives some background on “The Man That Got Away,” a song sung in private rooms of the Gershwins. With “The Saga of Jenny,” Noll retains the lilt, and allows the darkness to shine through, while winking at Jenny, through the ages and circumstances. She follows every lilt in the melody. Noll ended the evening with “My Ship” (music by Kurt Weill) With lyrics by Ira Gershwin, this poetic stroll through the psyche of the lead character in “Lady of the Dark” is nothing short of riveting, providing an introspective, mesmeric end to a truly elegant evening at The Metropolitan Room.